Wreckless Eric began his recording life on Stiff Records in 1977 with his enduring hit “Whole Wide World” when he was little more than an ex-teenage art student. 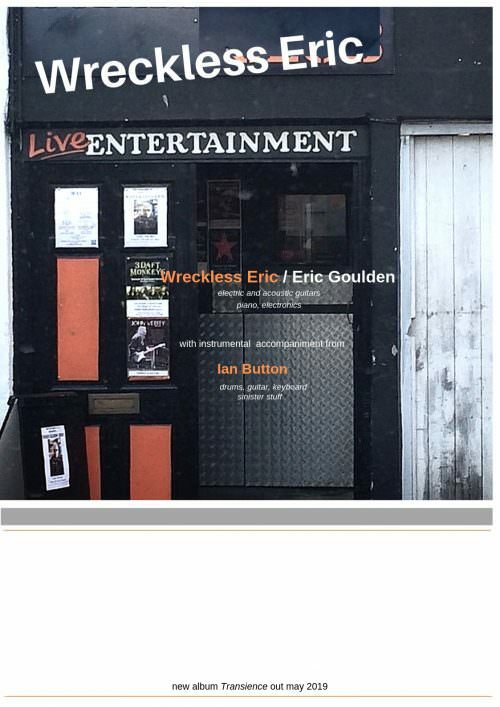 Wreckless Eric released three albums on Stiff Records between 1978-1980 – “Wreckless Eric”, “The Wonderful World of Wreckless Eric” and “Big Smash”. In the 1980’s he formed groups The Captains of Industry, The Len Bright Combo (with ex-members of Thee Milkshakes), The HItsville House Band and Le Beat Group Electrique. Reverting to the name Wreckless Eric for acclaimed albums on New Rose Records, Hangman Records and Fire Records, his 2018 album “Construction Time and Demolition” was regarded as a career high and arguably his finest moment. Eric Goulden, the man everyone knows as Wreckless Eric, is a rare example of an older and established artist who hasn’t lapsed into comfortable formulas. Exactly a year after his last album, the incredibly well-received Construction Time & Demolition, he’s back with a new album, Transience. On this album he’s joined by a collection of musical heavyweights including acoustic 12-string guitar player Alexander Turnquist, Cheap Trick bassist Tom Petersson and Amy Rigby on piano and backing vocals. Steve Goulding, late of Graham Parker & the Rumour, plays drums on the record, the first time he and Eric have recorded together since Eric’s enduring hit Whole Wide World back in 1976. For these tour dates Eric will be playing his huge sounding acoustic guitar, electric piano and a battered electric guitar through a series of homemade fuzz boxes. He’ll be accompanied by Ian Button (Papernut Cambridge, Death In Vegas) on drums, guitar and keyboard. Although he includes some of his older material and will always play Whole Wide World somewhere in the set, this won’t be a nostalgic stroll through the glory days. He’ll very likely play the every tune from his new album. Expect to be sonically and emotionally challenged.